Longoria went 1-for-4 with a solo home run in Tuesday's 7-3 win over the Nationals. Longoria upped his current hit streak to six, though none of those have been multi-hit performances. 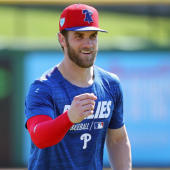 The veteran third baseman does have three extra-base hits over that stretch, which could be a sign that his bat is waking up after an ice-cold start to the season (.200/.224/.354). Power may be the only hope fantasy owners have for Longoria these days, as his batting average could flounder if his plate discipline (career-worst 0.13 BB/K) continues to trend in the wrong direction.